Something a little different, but still an A2 sized card. Used my nesties for the circles and the SU! scallop punch for the flower. Someday, I may get better at taking pictures. But, for now, I prefer to make the cards...just not into all that photography stuff, so my apologies for the poor photos! Spring, Spring It's time for Spring! That's what this card says! 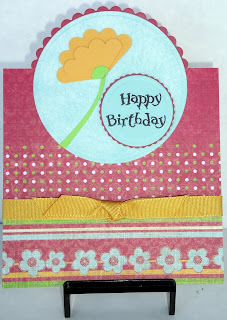 I have never made one of these topper cards-- may have to try one out! I can't believe I haven't made one of these tent topper cards! You've just inspired me to give it a go. Cute, Cute card! What a neat card. It did remind me of spring. Will have to try it sometime.